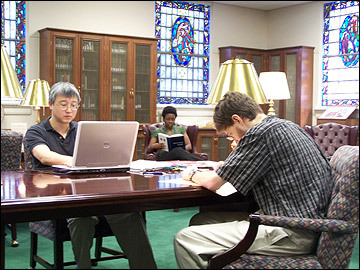 The Armstrong Browning Library is a non-circulating research library. All requested items must be used in the third-floor Belew Scholars' Room, with the exception of the Library's audio/visual holdings which are used in another third-floor location. While the book stacks are not open for browsing, the Library's resources are available to all--graduate and undergraduate students (disregarding school affiliation), post-doctoral scholars, and the general public. Readers will be expected to provide a photo ID, complete an Application for Use of Research Materials, and adhere to the Regulations for Use of Research Materials. Communication with library staff about your research needs in advance of your visit is encouraged. Fellowships are available for scholars who wish to conduct extensive research using the Library's holdings. For those who desire a quiet and elegant reading area but are not requesting the use of Armstrong Browning Library materials, a large and comfortable study hall is available on the main (second) floor in the John Leddy-Jones Research Hall. Equipment for the use of phonograph records, tape recordings, videos, slide projection, microfilm and microfiche is available on the third floor of the Library. Reproduction services are available to readers at a minimal cost. These services include photocopying as well as supplying images from Library resources. Complete instructions and order forms are available at the Library services desk or in the scholars' room.